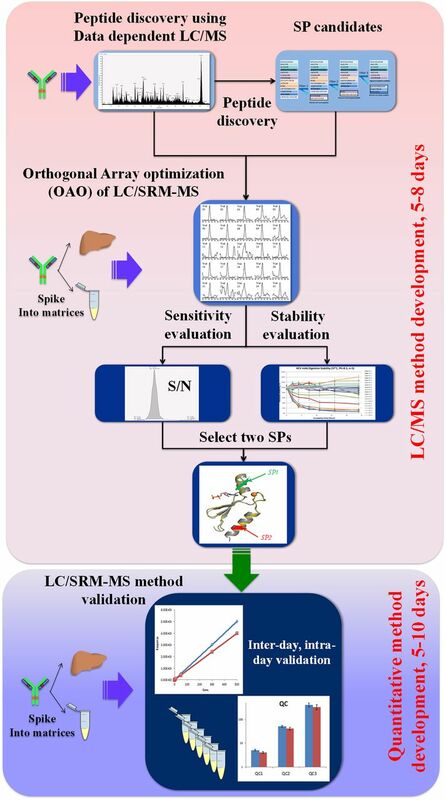 Flowchart of novel LC-SRM-MS method development process based on orthogonal array optimization. The detailed procedure can be found in previous publications. 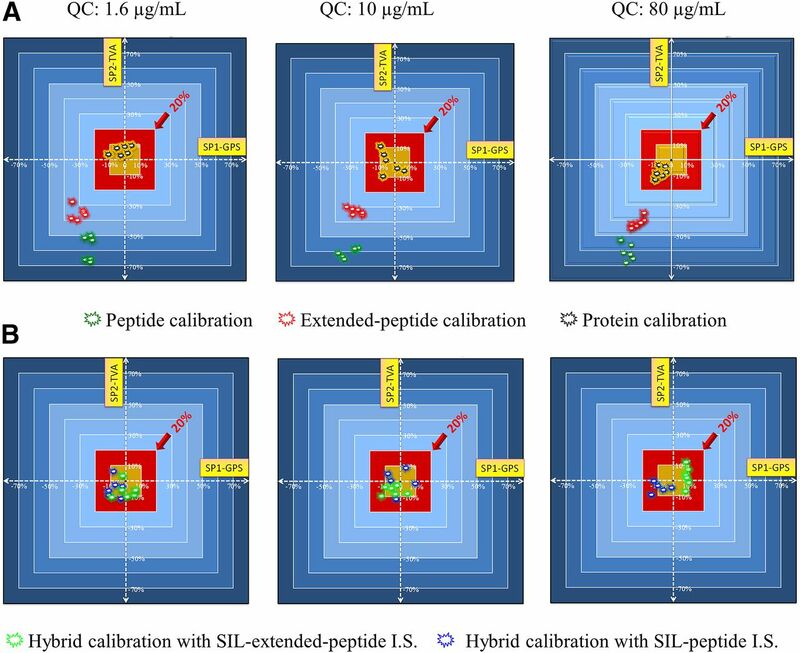 Two-dimensional representations of the quantitative biases by (A) peptide, extended-peptide, and protein level calibration approaches and (B) the two “hybrid” calibration approaches (protein calibrator with SIL peptide/SIL extended-peptide IS). Quality control samples were prepared by spiking blank plasma with pure protein at three levels: 1.6, 10, and 80 µg/mL. The purities of all standards were accurately measured by quantitative amino acid analysis method to eliminate bias arising from possible inaccurate purity. Five aliquots of each quality control sample were individually prepared and analyzed in replicates by the five calibration approaches. Each sample was analyzed three times on each of two different days (day 1 and day 14, N = 6, shown as individual data points). For every calibration method, the quantitative values were obtained independently using the two signature peptides (SP): the GPS and TVA peptides. The two axes represent the quantitative biases by the two SPs. The red box in the center of each panel denotes the zone of <20% bias, and the golden box signifies the zone of <10% bias. Reprinted from (Nouri-Nigjeh et al.) Copyright 2014, American Chemical Society.